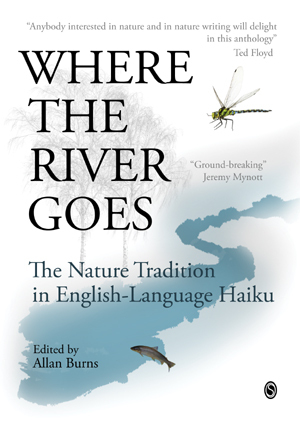 A landmark work in English-language haiku, with unprecedented scope and focus, Where the River Goes details and celebrates the evolution of the nature tradition of haiku over an active period of fifty years. Featuring more than nine hundred haiku, the anthology highlights and explores the work of forty essential “voices,” and identifies the key themes, subjects, techniques, ideologies, and developments of this tradition, evidencing its important and vibrant role within the broader literary genres of English-language haiku and nature writing. A landmark work in English-language haiku, with unprecedented scope and focus, Where the River Goes details and celebrates the evolution of the nature tradition of haiku over an active period of fifty years. Featuring more than nine hundred haiku, the anthology highlights and explores the work of forty essential “voices,” from pioneers such as James W. Hackett, Robert Spiess, and John Wills to major contemporary haiku poets who regularly write in a naturalistic mode. Informed by the meaning of “nature” from both Eastern and Western perspectives, the anthology identifies the key themes, subjects, techniques, ideologies, and developments of this tradition, evidencing its important and vibrant role within the broader literary genres of English-language haiku and nature writing. In an anthropocentric world of population explosion, intensifying urbanization, and widespread political and cultural indifference to our natural environment, these tiny poems encapsulate why nature matters. This is ecopoetry in the purest of senses: It intuits relations, not dissociation, evincing connections between humans and the natural world and an engagement that is essential to the human spirit and, ultimately, to any meaningful survival of our species. Adding its quietly resonant tones to the groundswell of calls for an ethical return to nature, this poetry collectively embodies Aldo Leopold’s assertion that receptivity must be built into “the still unlovely human mind” and draws on haiku’s great strength: that reference to the commonest, most humble phenomena can evoke a sublime cosmic viewpoint. Whether considering a scattering of clams on a riverbed as thunder mutters overhead or a wood-warbler moving from rock to rock through the riparian dusk, these haiku crystallize moments of genuine clarity into seemingly simple expressions that belie their actual depths. They exemplify “oneness with nature,” selflessness, and sabi in its most exalted sense and at the same time explore what it means to be human in a universe in which we are no more or less significant than the subjects of the poems. The challenge for the more ambitious haiku poets of each generation is to adapt the genre to their own time and place while maintaining the essential aesthetic properties that lend the art its compressed grandeur. Where the River Goes convincingly re-presents the case for nature haiku at a time when most haiku poets have focused on urban or sociological themes or on expressions of self rooted more in opaque language and Western influence on haiku than in the traditional aesthetics of the genre. Invariably multi-dimensional, these nature haiku transcend mere sketches, embrace poetic subtleties, and evidence a fundamental lack of jadedness about haiku, experience, and the world.